What most people know about Liu Xiaobo is that he was a courageous writer who challenged the Chinese government, won a Nobel Peace Prize, and ended up in jail. But there is a great deal more to know—about Liu, his activities, his social circle, his trial, and about the implications of his case for China’s future. To explore these wider themes is the purpose of this valuable book. As well, the book has a second purpose. Liu Xiaobo has by now been in prison for three years of his 11 year sentence. It has been two years since the Nobel Peace Prize was conferred on him. With the passage of time, the fact of his imprisonment has faded into the background of world news, tolerated as part of the status quo despite its injustice. The distinguished roster of contributors to this volume—leading Chinese lawyers and activists, Hong Kong-based scholars, and Western China specialists—want to remind us that Liu is still in prison. Jean-Philippe Béja explains how Liu traveled from being a literary critic to a peace prize winner. As a young scholar of Chinese literature he was appalled by the indirectness and “shyness” of contemporary writers, who were scarred by politics, and became famous for his sharp criticisms of contemporary literature. Returning from a visiting scholar position at Columbia University to throw himself into the 1989 Tiananmen demonstrations, he was one of a small group who negotiated a peaceful withdrawal of the students from the Square before the military moved in. His reward was 20 months’ detention in Qincheng prison on the charge of “counterrevolutionary propaganda and incitement.” Béja says Liu was “transfigured” by this experience, in large part because of his sense of guilt at having survived when so many had died. He turned his attention away from literature and committed himself to politics, based on the Havelian principle of living in truth. He criticized the Communist Party of China, supported the rights-defense movement, called for an apology for the Tiananmen killings, and supported the Tiananmen Mothers, a group of survivors of the killings and families of victims. Despite a second three-year imprisonment, this time in a labor reeducation camp, he continued to survive by writing for the overseas Chinese language press, and as the Internet emerged he published more and more on the Web. It was as a result of these activities that Liu was sentenced in 2009 for violation of Article 105, Paragraph 2, of China’s Criminal Law, which defines a crime called “inciting subversion of state power.” Six articles published on the Internet were cited in his conviction. But his main crime was to lead in drafting and collecting signatures for Charter 08. What is this crime of incitement to subversion? Joshua Rosenzweig provides a thorough study of the relevant article of the Chinese criminal code. Article 105(2) was put in place in 1997 to replace the former crime of “counterrevolutionary propaganda and incitement,” which Chinese legal experts deemed to be a political crime, out of touch with modern legal concepts and in violation of international human rights standards. Subversion was a more acceptable idea, but as Rosenzweig shows it boiled down to the same thing. Paragraph One of this article involves “organizing, plotting, or carrying out” subversion. Since Liu had not done this, he was charged under paragraph 2, “inciting” subversion. But since Liu did not in fact call for any acts of opposition to the government, for violence, for overthrowing the regime, what he committed was actually a speech crime, and his conviction was based on the premise that any criticism of the regime by the wrong person in the wrong time and place constituted incitement to subversion. Using the Duihua Foundation database of political prisoner information, Rosenzweig shows that this article had been used at least 74 times to convict Chinese individuals between the time the law came into force and the end of 2010. Most of them were convicted for expressing liberal democratic ideas or for criticizing corruption or abuse of power. Chinese attorney Teng Biao elaborates the political meaning of this crime. Agreeing that the crime of inciting subversion of state power is an updated form of the old crime of counterrevolutionary propaganda and incitement, Teng points out that in either form, it constitutes a “deprivation of the right to effect a lawful change of government”—in other words, a negation of democracy, and not only of “Western-style” democracy but of democracy in any meaningful form. Teng quotes Human Rights In China board member Hu Ping’s analysis that authoritarian regimes cultivate apathy and cynicism among their citizens and then rely upon this apathy as a chief source of legitimacy. However, as repression becomes more costly and difficult, and fear diminishes, such a policy must be less and less successful. Rosenzweig also explains the strategies and arguments of Liu’s defense lawyers. These included denying any intent to incite subversion, and showing that none of Liu’s critical statements were beyond what Party leaders historically had allowed, encouraged, or said themselves. They argued that no social harm was done, and they mentioned international standards of freedom of speech, as found for example in the Universal Declaration of Human Rights. They said that criticizing the Party is not the same thing as attacking “state political power.” As usual in such cases, these and other defenses did not alter the predetermined decision of the court. These insights are elaborated in a chapter by Mo Shaoping, Gao Xia, Lü Xi, and Chen Zerui, lawyers who have often defended political cases. They discuss a series of procedural obstacles they have met in trying to defend such cases, among them denial of access to the client and to case files and inability to call witnesses. Applying these insights to the Liu case, they catalogue many procedural violations that occurred in the handling of the case. They end by pointing out that all these issues are symptoms of a larger structural problem. The courts are not independent when it comes to political cases. In pursuit of their obligation to obey the political-legal committee that controls them, they often have to violate procedural rules. Feng Chongyi’s chapter extends this analysis. In his view, the regime was not wrong to regard Charter 08 as a significant threat, for three reasons. First, in drafting it, Liu had been able to draw together a broad coalition of previously fractured liberal forces around a core idea. Second, this idea made real sense for China as an alternative to the current form of government. Charter 08 called for “constitutional democracy,” an idea with a long pedigree in China and one that is adapted to China’s “national conditions” (guoqing)—conditions often cited by the CPC as the reason why the country can only choose to continue under its dictatorship. And the Charter argued for peaceful, gradual transition to this form of government, thus answering the CPC claim that any change in form of government would lead to chaos. Third, for these reasons, Charter 08 provided and continues potentially to provide a rallying point for the weak and dispersed, but broad and growing, movement of the disadvantaged and abused in China. This movement in Feng’s view consists not merely of a small set of lawyers who defend political prisoners or of peripheral intellectuals who write programmatic articles. It is instead a movement of many sectors of society who share a growing rights consciousness and the willingness to struggle against abuses in a variety of ways, some confrontational but all law-abiding. Since the regime claims to respect and promote people’s rights, Charter 08 put the Party in a difficult position by in effect calling its bluff. To deal with Charter 08 the authorities had to treat the call for rights as a threat, rather than as a solution to problems everyone acknowledges exist. In short, “the publication of Charter 08 marked the unprecedented maturity of Chinese liberalism,” and hence an epoch-making step forward in Chinese history. The truth of Feng’s analysis is shown in the chapter by Liu’s friend Cui Weiping, a film and literary critic, who describes a kind of performance art that she conducted after Liu’s conviction, aiming to break through the official silence about Liu’s case. She used Twitter to circulate comments that she collected in telephone interviews, mostly from 148 intellectuals of Liu’s and her generation (including one from Vaclav Havel). A selection of those tweets is reproduced in the volume. They give a sense of the breadth of Liu’s influence, and how his conviction laid bare the regime’s lawlessness in the eyes of a broad stratum of top thinkers. Man Yee Karen Lee elaborates this theme by tracing how human dignity has been a goal of political actors throughout the history of modern China, and especially in recent discourse. 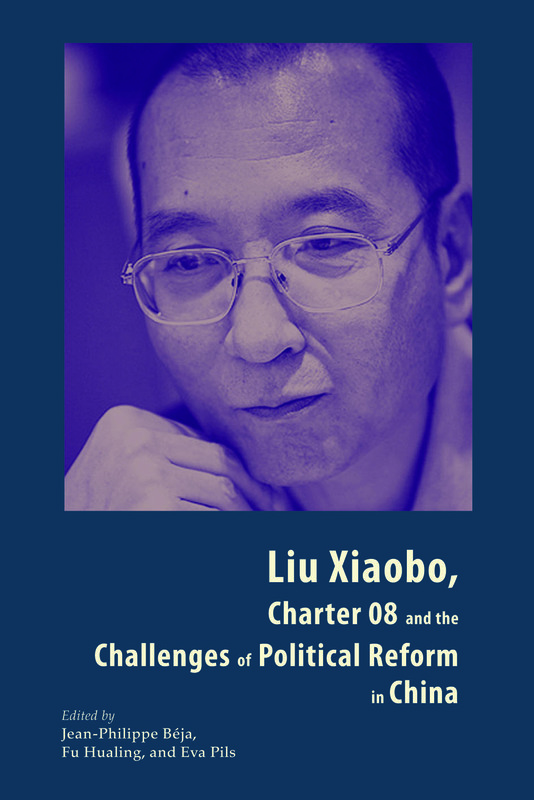 While Wen Jiabao has supported dignity and the Chinese constitution seeks to protect “personal dignity,” the idea has also been a thread throughout Liu Xiaobo’s thought and correlates with his Havelian notion of living in truth. Also elaborating the connection with Havel, Michaela Kotyzova explores the relationship of Charter 08 with the Czechoslovak Charta 77 movement, which Havel led. Although the Chinese document intentionally alluded to the Czech one, Kotynzova argues that it is wrong to conclude that Charter 08 either aimed to, or could, pull down the Chinese regime. The Chinese regime has many of the same structural flaws (overconcentration of power, lack of accountability) but is not as vulnerable as that of Czechoslovakia, which was economically weak, a client state of a foreign power, and lacked any domestic legitimacy. However, she adds, both charters articulated the same vision of peaceful transition to a rule of law society, a vision more consistent with the regimes’ expressed ideals and with international norms than are either regime’s actual behaviors. And both charters served as rallying points for disparate social forces desiring change. As a result, she concludes, Charter 08 can serve the same function as Charta 77, that of a long term, viable vision that can help guide society when, inevitably, change happens. Within the broad social movement for change that several authors describe, lawyers have played a central role, imparting the weiquan—rights defense—movement’s specific focus and strategy of working within Chinese law to expand the ambit of freedom and justice. Fu Hualing analyzes two main roles that rights-defense lawyers have played. Some have pursued a public interest agenda and others a more political agenda. If those pursuing the latter agenda are better known and more closely connected with Liu Xiaobo, those pursuing the former agenda are a wider group with a deeper social base. They have used the law to address issues like discrimination, women’s rights, public health, the environment, and land rights. They have done so more and more assertively, often using constitutional arguments and reinforcing lawsuits with publicity from sympathetic media. A major message of Fu’s analysis is that the Chinese regime, like other modernizing authoritarian regimes before it, has to some extent become mired in an institutional complex of its own making. It needed to build a legal system to bring orderly administration to a more liberal, more marketized society. By developing rule of law as a way of dealing with the inevitable social conflicts of a modernizing society, the regime tried to use rule of law as “an alternative to democratization”—a phenomenon known in the comparative legal systems literature as “the judicialization of politics.” To be sure, the Party tried to control the legal system by appointing judges and licensing lawyers. But even a controlled legal system has latent potentialities for independent action on the part of professionally trained staff, who have a distinct professional identity and who are trained to follow laws and procedures. Michael Dowdle analyzes this process in terms of “popular constitutionalism.” The regime has promoted the idea of a constitution and rule of law. The Party uses the idea when convenient, as in the trial of Jiang Qing in 1980, and tries to pull back from it when convenient, as in the retreat from legal procedures since 2005. But there is something of a ratchet effect in people’s expectations. Civil society is growing, and people with problems tend to think about the constitution as a solution, whether or not the regime finds it convenient that they do so. As a result, rule of law gradually transforms from a tool of the regime to a potential restraint on it. Dowdle closes by showing that Charter 08 was a signal moment in this gradual evolution. His analysis, like others in the volume, helps to explain why the regime saw such a threat in Charter 08. The Charter’s ideas will continue to appeal whenever people have a chance to read it. Eva Pils points out that the regime, of course, tries to prevent this from happening. It is a crime to circulate the Charter. This is part of a general trend of repressing constitutional and legal arguments. But the result, she argues, is that people trying to protect their rights are driven more and more into violent resistance, what she calls a “darker side” of the weiquan movement. A vicious cycle seems to have set in, in which the regime responds to a more angry and vindictive form of rights expression with more extralegal repression such as illegal disappearances and forced evictions. But this regrettable trend only illustrates the continuing relevance of Charter 08 as a better vision, a way out of an intensifying impasse. It falls to Willy Wo-Lap Lam to sort out these contradictory trends. Even though Charter 08 marks the best way forward for China, Lam argues that the regime will not accept it. It is determined to maintain exclusive one-party control. This is the meaning of the decision to put Liu Xiaobo in jail even though to do so required such a travesty of the regime’s own legal process. Lam points to the authorities’ fear of the international color revolutions and of the Internet as motives. Liu stood as a symbol of both of these bogeymen, because of his international contacts and use of the Web. As Liu sits in jail, as his wife suffers under illegal house arrest, and as his many friends and colleagues at home and abroad continue to honor him in their hearts, the ruling party continues on course, adopting ever more conservative ideologies, seeking what Lam calls “limited reconciliation” on its own terms with isolated social forces, and beefing up repression. Liu, like some other Nobel Peace Prize winners, is likely to be vindicated by history. But how long will it take? Andrew J. Nathan (黎安友) is Class of 1919 Professor of Political Science at Columbia University and chair of the steering committee of the Columbia University Center for the Study of Human Rights. He is the chair of the board of Human Rights in China, co-editor of The Tiananmen Papers and How East Asians View Democracy, and coauthor of the new book, China’s Search for Security.